We have a hard time believing that we've been driving the Wine Works train down the tracks for 5 years already. So much has changed, and it's humbling to look back and realize how far we've come in that time. The wines have always remained priority number one, and we are always looking for ways to improve. We truly have the most wonderful customers any business could ask for, which makes it such a pleasure to come to work everyday. As usual, we're celebrating with our 20% off sale, the best time of the year to get wine started. Always feel free to call one of our shops and chat with our incredible staff, they're their to make sure everything is just right! The sale ends April 12th, so don't hesitate!! Five exceptional wines from some of the world's most renowned wine growing regions. 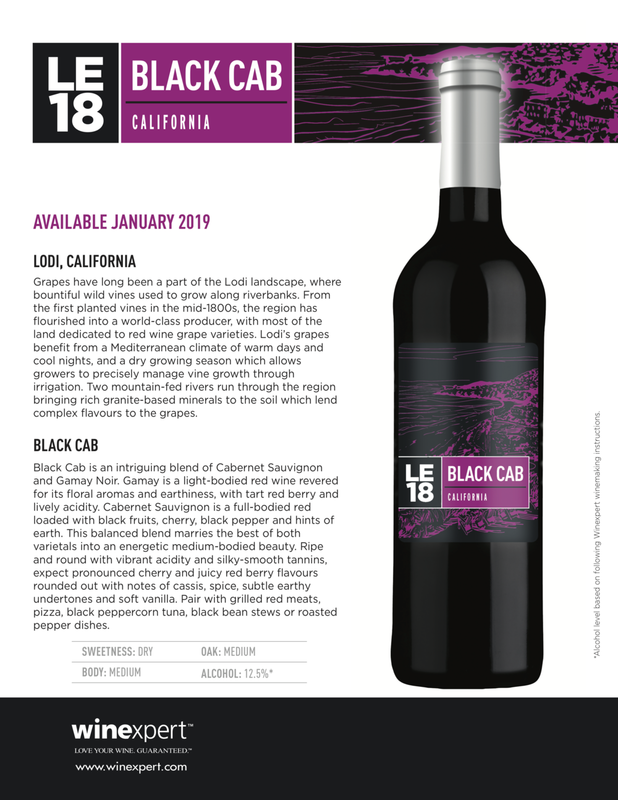 Continuing the rich and celebrated traction of excellence and ingenuity, the LE18 collection is a showcase of much-loved varietals and unique, standout blends. From the bold and sumptuous big Italian Barbaresco red, to the light, bright and subtly sweet California Symphony Gewürztraminer white, this collection offers something for every wine lover. Pre-order deadline is Friday November 30th. Call either shop to reserve yours today! Click on the picture below to see each wine. Intense, masterful, defiant or smooth—whatever the preference,there’s a tale in every wine. A winefor every tale, and a fugitive for everycellar... four notoriously great ones. We’re quite certain Ned would have made sure there was plenty of wine ready. Well with 20% off every wine in the shops, this is the time to make it happen. From September 24th-28th save 20% off any wine we sell. Drop in to either shop or give us a call for more info. Another tasting is coming! Wine Works has worked hard this fall to secure expert sommelier Tim Ellison to act as our guide through the 2017 Limited Edition wines from Winexpert. There will be five wines, 3 red and 2 white, each of which will be expertly and creatively paired with food prepared by the culinary mastermind behind Heartbeet Bistro, Chef Michel Kuhn. This guided tasting will be a more intimate night than our previous event in 2015, and as such tickets are limited. Tickets are $45 and will be on sale Thursday November 9th , available at both Wine Works locations. Only 50 tickets are available. Guided tasting by Tim Ellison of the 2017 Limited Editions. 5 wines in total, 3 red and 2 white. Food pairing by Chef Michel Kuhn. Sure to be creative and delicious, thoughtfully designed by Chef Michel to bring out the best in each of the wines. Venue: The Bean Tree Cafe. Doors open at 6:00pm, tasting to start almost immediately. Tickets are $45 each. Limited to 50 guests. Available at both Wine Works locations. Do not hesitate, tickets will sell out quickly! Every year, while we quietly go about our day to day business, there are experts going around the world trying to find the best growing regions and the grapes they produce. These wines are usually identified around 2 years in advance, giving our suppliers time to work with different growers making sure they can produce just the right grapes at just the right times. The grapes wind their way through the early life stages of becoming a wine, and when they are finally turned into juice, we get to bring them into the shops and put our finishing touches on them where they turn into some of the best tasting, highest quality wines we produce each year. For better or worse, they're only available for a limited time. This year we're excited to bring 5 different wines to the shop, each with its own exciting characteristics! Each wine must be pre-ordered by December 1st to guarantee availability. Don't miss out! Restricted Quantities bring you four of our finest award-winning wines, released exclusively in The Gold Standard Collection. These exclusive wines are the best we can create, with unmatched drinking and aging potential. From renowned German vineyards, this Riesling is captivating and complex. Grisp flavors of honey, peach and lemon finish with a lingering minerality. We've finally made it! The story of how Corissa and I made the pilgrimage back home has been featured in the Spring 2015 issue of Go Kimberley. Check out the digital version here or grab a copy almost anywhere in Kimberley!